The Coconut Chair was designed in 1955 by the then Director of Design of the Herman Miller furniture company, George Nelson, and it instantly became a modern classic. Its success should not come as a surprise, since the chair’s creator is one of the most notable figures in the history of the American modernism. 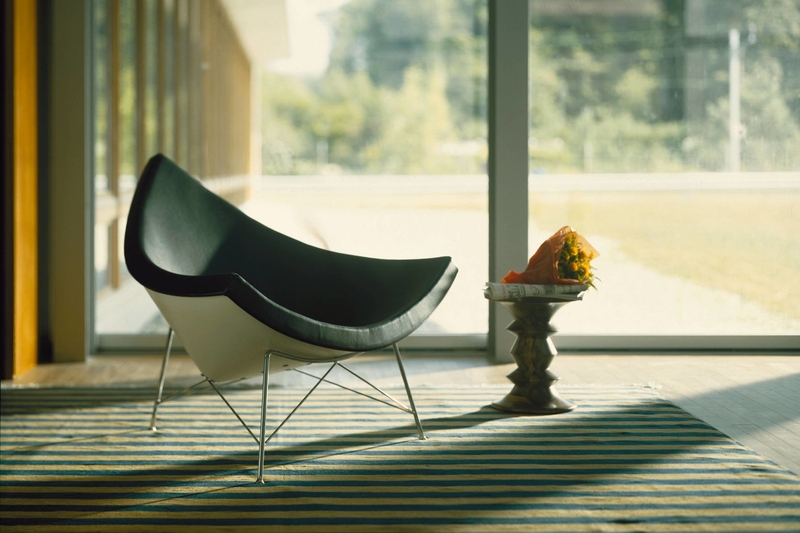 The history of the Coconut Chair has its roots in the early European modernism and its pioneers, including Ludwig Mies Van Der Rohe, Gio Ponti and Le Corbusier, whose work greatly inspired young Nelson during his stay in Europe. Clean, simplistic forms devoid of any unnecessary ornaments left their stamp on Nelson’s future designs. After several years following his return to the US, Nelson’s potential got noticed by D.J. Depree, the chairman of the Herman Miller company. Despite Nelson’s lack of experience in the furniture design, Depree offered him a position of the company’s next Director of Design, which he accepted in 1945. Since then, for over 25 years Nelson had been providing furniture projects for the company, including the sensational playful design of the Coconut Chair. As the name implies, the chair resembles of a chunk of coconut with reversed colours. However, that tropical fruit was not the only inspiration for Nelson. The shell of the chair is strikingly similar to the dome of the MIT’s Kresge Auditorium. It is also worth to remember that the chair’s design came by in the middle 1950’s, which was the beginning of the space race between Russia and USA. That period in the modern history, when the human kind was hugely fascinated with outer space, also found its reflection in Nelson’s designs. He strongly believed that: “Design is a response to social change.” While looking at the Coconut chair, one can easily make a connection to the early satellites such as Russia’s Sputnik 1. The chair’s lightweight shell is made of plastic, which is shaped in a molding process. It is white in appearance, with a satin surface finish. The comfort of sitting is guaranteed by a thick layer of foam rubber upholstered in black, supple leather. The colour scheme creates an interesting, intense contrast between the white shell and the black cushion. The chair is supported on three thin, chrome-coated legs made of bent steel rods, equipped with the nylon glides at the ends. Legs are spanned with the diagonal crossbars for additional structural strength. The chair’s well-balanced proportions are achieved through the geometrical consistency between the three-leg base and the triangular sitting pan. The Coconut Chair is an absolute essence of the modernistic design. More than 50 years after its presentation, the chair has not lost anything from its futurism. This timeless piece of furniture still looks extravagant and intriguing, making it a great, tasteful addition to any modern interior. After becoming a director of design at the Herman Miller furniture company, Nelson funded a design studio. The studio, called George Nelson Associates, Inc., was known for bringing together many talented designers of the era, who provided Herman Miller with the modernism-driven furniture designs, examples of which include the Coconut Chair and the Marshmallow Sofa. Although the Coconut Chair is mostly associated with George Nelson, he did not create the chair individually. George Mulhauser is said to have greatly contributed to the chair’s design. The case of Mulhauser is not the only example where Nelson accepted credit for the work of other people employed at his studio. John Pile, a designer who worked for Nelson in the 50’s, commented about this practice: "George's attitude was that it was okay for individual designers to be given credit in trade publications, but for the consumer world, the credit should always be to the firm, not the individual. He didn't always follow through on that policy though."